We are also looking for nominations to chair the SSIT Pillar on Universal Access to Technology. If you are interested in getting involved, please contact me at pcunningham@ieee.org, Subject: SSIT 5 Pillars “your pillar of interest.” You can help me point you in the right direction by briefly describing your previous activities and track record in this field, your location (city, chapter, section), two sub-committees of interest, and some insight into the contribution you believe you can make. A responsible volunteer will follow up with you. Please encourage respected peers (including Students and Young Professionals) to join SSIT and consider volunteering. Now is a perfect time for them to join with half-year membership rates (US$16.50 or US$2 for Student members). This is a fabulous opportunity to join our vibrant, growing, global community! We are pleased to continue our series of introductions to members of the volunteer leadership team whose hard work makes SSIT a successful organization with wide-ranging influence that extends throughout the IEEE’s global, multi-disciplinary community. John Impagliazzo is an IEEE Fellow and Life Member, a director on the IEEE Foundation, and a member of the Long Island Section of Region 1, hailing from Fort Salonga, New York (USA). He has served SSIT since 2013 in roles focused on constitution and bylaws issues, and is our current chair of publications. His current interests include engineering and computing curricula and accreditation, computing history and ethics, and the effects of emerging technologies on society. Carlos E. Jimenez-Gomez, an IEEE Senior member in the Schenectady Section of Region 1, is based in Niskayuna, New York (USA). He has been an SSIT volunteer since 2014, and is both an IEEE SSIT Distinguished Lecturer and co-founder of the joint IEEE Cyber Ethics and Cyber Peace initiative, which started in 2015. His interests extend to all five of SSIT’s central pillars, and his work focuses on digital government as well as modernization of justice within our “information society,” and championing the importance of openness and transparency in government. To learn more about his interests, visit his website. Luis Kun, IEEE Fellow and Life member in NoVA, Washington (the National Capital Area Section of Region 2) lives in Vienna, VA, USA, and has volunteered with the SSIT since 2005. He has held numerous leadership roles with the organization, including several years on the Board of Governors, stints as chair of membership and conferences, and-his current title-Distinguished Lecturer and Chair. In 2016, he was a panelist at the Organization for Economic Co-operation (OECD) ministerial meeting, where he was also a Hackathon judge, and he has served as Life Sciences Technical Committee (LSTC) representative from 2016 through to the present. Like Jimenez-Gomez, his interests encompass the SSIT’s 5 Pillars, and his work has extended beyond the SSIT to broader IEEE engagement as a member of the IEEE Technical Activities Board and Publications/Editorial boards. We encourage all SSIT members to submit your details to our volunteer directory. Remember that the submission deadline for the March 2018 Joint Special Issue of IEEE Technology and Society Magazine and IEEE Robotics and Automation Magazine is fast approaching! Additional information about each call for papers is available at the links below below. For further inquiries, please email Katina Michael at: katina@uow.edu.au. Dr. Katina Michael, senior editor of IEEE Consumer Electronics Magazine, invites contributions to the publication’s Socio-economic Impacts section. For more information, visit the CE Magazine webpage or contact Katina at katina@uow.edu.au. Publish your Ethical Dilemma in the SSIT and Life Members Committee (LMC) Newsletter As we mentioned last month, the SSIT and LMC have approved an initiative to publish brief articles (300-500 words) detailing society members’ experiences grappling with ethical dilemmas in professional contexts. Beginning in June 2017, contributions of this sort will be published simultaneously in both newsletters after authors work with the editors of the two publications. If you have a story to tell, please contact the SSIT newsletter editor, Dr. Heather Love at Heather.Love@usd.edu. Hosted by the government of Namibia through the National Commission on Research, Science and Technology, supported by the European Commission and African Union Commission, and technically co-sponsored by IEEE Society on Social Implications of Technology (SSIT), IEEE Region 8 and IEEE South Africa Section, IST-Africa Week 2017 is the twelfth in an annual series of Ministerial level Technology Research and Innovation Conferences focused on Sustainable Development and International Research Cooperation. IST-Africa is cooperating with IEEE to organise the first IEEE Experts in Technology and Policy (ETAP) Forum on Internet Governance, Cybersecurity and Privacy to take place in Africa as the pre-conference event on Tuesday 30 May. The ISTAS 2017 conference in Sydney has been scheduled to coincide with the annual IEEE Panel of Conference Organizers (IEEE POCO) event from 7-9 August 2017, and the biennial IEEE Sections Congress from 11-13 August 2017. The theme for ISTAS 2017 is “From Good Ideas to Practical Solutions,” and is designed to focus on how we can identify a good technological idea and transition it into a practical solution that delivers real benefits to society. It will bring together scientists, engineers, technologists and scholars from multiple disciplines to hold a dialogue on many technological and societal issues, and collaborate on the co-creation of ideas to develop and utilize innovative solutions to address them. The theme for IEEE ETHICS 2017 is Ethical Innovations in AI/AS. Financial co-sponsors for the conference include SSIT, IEEE-USA, IEEE Standards Association and the Southeastern Michigan Section (SEM). Technical co-sponsors include the TA/TechEthics Initiative. 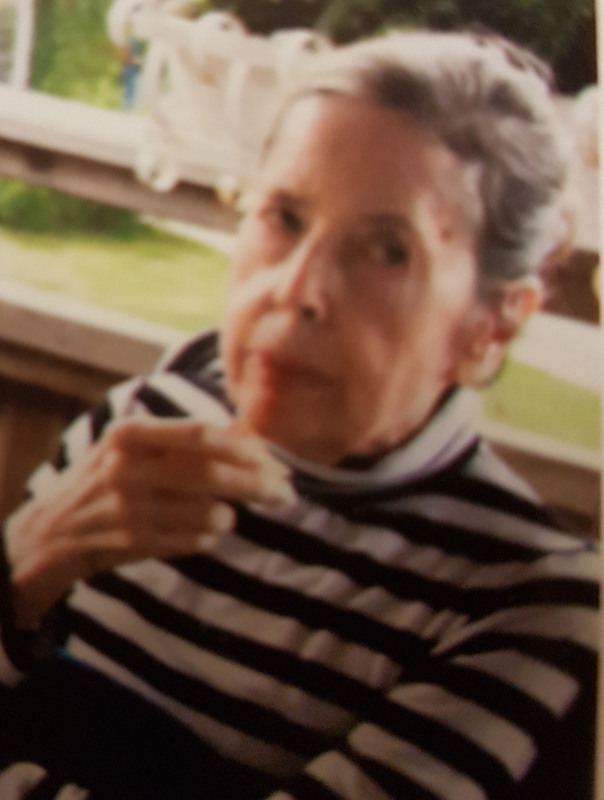 On 28 February 2017, IEEE Mmmber Virginia Mary Edgerton passed away in a nursing home in Sweden. Virginia was the first IEEE Member and woman to request and receive ethical support from the then brand new Member Conduct Committee (MCC) in 1978. The MCC issued its report in June 1978 supporting her actions. She was also the second recipient of the IEEE SSIT Carl Barus Award for Outstanding Service in the Public Interest. 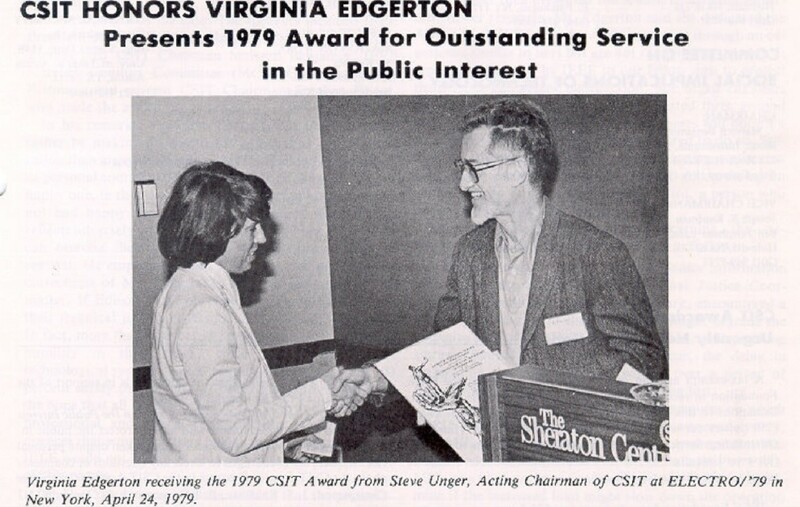 I never met Virginia Edgerton personally but I did play a part in her getting IEEE support for her ethics conflict with a former employer in New York City. One day in 1977, about the time I, Dr. Stephen H. Unger and others on the IEEE-USA Activities Board Ethics Task Force (USAB), developed the USAB procedures to discipline members and provide them ethical support, I received a telephone call from Virginia Edgerton asking for IEEE ethical support of her actions taken in a police dispatch system she was working on, which led to her being terminated for elevating her concerns above her unsympathetic Supervisor. I referred her to Steve Unger, who took it from there, as the story is told next. The two reports in this issue of Technology and Society are outgrowths of a case involving Ms. Virginia Edgerton, a senior information scientist with the Circle Project of the New York City Criminal Justice Coordinating Council, who was discharged after raising questions concering the efficacy of a computerized police emergency dispatch system-first to her supervisor and finally to the members of the Circle Committee. Ms. Edgerton contacted CSIT in June 1977, requesting assistance. At that time no formal mechanism existed within IEEE for evaluation potential ethics cases. After a subcommittee of CSIT’s Working Group Ethics and Employment Pracices (chaired by Stephan Unger) completed its investigation of the case reported on here. 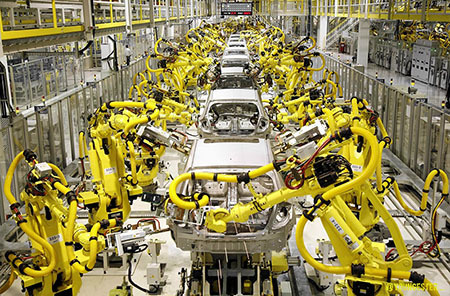 IEEE instituted formal procedures for handling such situations. These were placed under the jurisdiction of the Member Conduct Committee (MCC). When the CSIT report was presented to the Executive Committee of the IEEE Board of Directors 21 May 1978, that body referred the matter to the MCC for consideration under the new procedures. Both the report and the complete file on which it was based, were then turned over to the MCC. That group, chaired by James Fairman, reviewed the file, obtained a notarized statement from Ms. Edgerton, the individual seeking support, and then drafted its own report. Following the precedent set by the CSIT subcommittee, this draft was sent to the managers involved for their comments, and was subsequently presented to the IEEE Executive Committee with the recommendation that both the MCC and CSIT reports be published and that certain other steps be taken in support of Ms. Edgerton. The Executive Committee then directed General Manager Richard Emberson to seek the opinion of IEEE’s attorney, James Wiener, concerning the legal aspects of publication. After discussion and some correspondence involving Dr. Emberson, Mr. Wiener, Mr. Fairman and Dr. Under, a consensus was reached that full publication was appropriate. This view was conveyed to the Executive Committee which, at its October meeting, approved such publication. An article summarizing the Edgerton case appeared in the December 1978 issue of The Institute. Both committee reports are reprinted in their entirety here. Subsequent to this, the new IEEE Society on Social Implications of Technology (SSIT), awarded Virginia the second Carl Barus Award for Outstanding Service in the Public Interest. Below is the photograph of Dr. Stephen H. Unger presenting Virginia Edgerton her Barus Award. On a more personal side of Virginia, here is a first-hand account by Robert Osband, of the interaction he had with Virginia in the 1970s when both resided in the New York Area. “I am very saddened to learn of the death of my old friend Virginia Edgerton. She was a customer in the mid 1970s when I worked at The Computer Store of New York on 39th St near 6th Ave. When I moved across town to The Computer Mart on 30th St and Madison, she found me there, and became a “regular” in the Books section of the shop. We became friends and would occasionally chat over a beer at a little “British pub” near her apartment house on Park Ave South. On 17 December 1978, we stopped for coffee at a restaurant called “Kitty Hawk” in Manhattan we happened to be passing on the 75th Anniversary of the Wright Brother’s First Flight. Virginia’s odyssey with the whistle blowing she did took years to get her recognition, but I was happy that she asked me to accompany her when she got her award from the IEEE, and naturally, I was very proud of her for receiving it. One day, she came into the Computer Mart and pleaded with me to take over a class she was giving as an Adjunct Instructor at Baruch College on “Introduction to Teleprocessing.” She needed to find someone to take over the class before the school would let her out of her contract so she could take a job in Ohio. I agreed, and taught the class for a couple of years, but that was the last contact I had with Virginia. I’m sorry I have no further information to help you with, though I now recall a conversation we had that she had also attend the “Convocation on Communications honoring the 100th anniversary of the Telephone” at MIT in 1976. I was living in Cambridge, MA at the time with a group of science fiction fans, and was a bit of a “phone freak” even then. The highlight of that event was getting to meet Arthur C. Clark the science fiction author who had first calculated the Geostationary Orbit published in Wireless World magazine in 1945. When Clark remarked in his speech at that time that an “Infomaniac” was someone who needed to be where the information was anytime he could get there, it was all I could do to keep my seat, and NOT jump up and yell, “That’s Right! That’s why I’m here!” I always think of that whenever I attend a trade show exhibit hall. This feature was compiled by Walter L. Elden, P.E. (Ret), IEEE and SSIT Life Senior member. If you would like to submit a news item, SSIT-related update, volunteer opportunity, Call For Papers, award notice, or idea for a “Feature Article” for a future issue of the SSIT newsletter, please contact the editor Dr. Heather Love at Heather.Love@usd.edu. Submissions for the May 2017 newsletter are due 24 April 2017.